My Interview With Deborah Jay! The lovely and talented Deborah Jay! Today, I will be introducing you to one of my favourite people, Deborah Jay. I have reviewed both of her books here on my site, and am happy to have her visit with me. Deborah Jay is the author (so far, of course!) of two marvelous books, the most recent of which is Desprite Measures. Her earlier book, The Prince’s Man is, as Deborah so eloquently puts it, Think James Bond meets Lord of the Rings. She is also the author of Desprite Measures, the first in The Caledonian Sprite Series a fantasy set in the area of Inverness, Scotland – and the holder of my own, personal “Best Cover Ever!” award! But that isn’t all – Deborah also writes under the name Debby Lush, offering two must-have non-fiction books for the aspiring dressage competitor: The Successful Dressage Competitor: Everything You Need to Know about Competing in Dressage and The Building Blocks of Training: A Step-By-Step Guide to the Gymnastic Development of the Equine Athlete. This fascinating woman is incredibly interesting. Have a read of our interview and I am sure you will agree! One of the things I get a kick out of when I read about you is your love of science fiction and fantasy “from birth.” So what was your favorite TV show, and how do your memories from that show help you write today? Now I have to go see if I can find it on Netflix! Without doubt, Gerry Anderson’s UFO. It combined all my favourite elements – aliens, space travel and secrecy. For those who haven’t come across it, the premise was of an alien invasion by an advanced but dying race, visiting earth to harvest organs for transplant. Sometimes they’d take just the organs, sometimes whole people. The governments of the world wanted the whole thing kept secret, so the headquarters of SHADO (Supreme Headquarters Alien Defence Organisation) were beneath a film studio – a great place to disguise strange comings and goings. The space travel was only as far as Moonbase, but this was just a few years post the real moon landings, so a functioning lunar base was an exciting prospect. Although I’ve moved into writing fantasy these days, my first love was science fiction, and for me this series had it all. The clandestine side in particular shows up in both my novels so far – the need to keep secrets from the general population is a theme that I like to play with, as it’s one I don’t really approve of! Many writers take up the pen from a very early age. When did you first start writing stories? I started writing stories down as soon as I mastered a reasonable ability to wield a pen. I remember dreaming them up and telling them verbally even before that. I tackled my first novel at age 9, and then wrote and sketched a comic book series for several editions. Sadly my artistic talents are minimal, so after a bit I went back to straightforward writing. I grew up in an era before computers (makes me feel ancient!) so keyboard skills were not taught in general education, but with the idea that I wanted to be a writer I taught myself to touch type when I was 11 years old, although my first few manuscripts were written longhand as I didn’t own a typewriter. Let’s stay young (we all like that, right?) When you were a child you read voraciously. So tell me who were your favorite authors of the day and how do they influence you today? Early on I read lots of space stories, borrowing extensively from the library. Probably my first series love would be E. E. ‘Doc’ Smith’s LENSMAN series – lots of action, subterfuge, space travel and heroic but vulnerable characters. I moved on to the SF ‘classics’ – Frank Herbert’s DUNE, which blew me away with its scope, Asimov’s FOUNDATION TRILOGY where I developed my abiding love for secrets within secrets, and his ROBOT series for their mix of futuristic setting and detective work. Love, love, love THE 3 LAWS OF ROBOTICS, and was thrilled years later when the positronic brain showed up in Star Trek TNG, with Data and his daughter, Lal. Heinlein’s novels also featured in there, along with WINDHAVEN (by Lisa Tuttle and guess who? One George R R Martin, years before he was famous!) and Anne Mccaffrey’s Dragon series, which started to blur the lines between SF and fantasy for me. And then I found Marion Zimmer Bradley’s DARKOVER series. Sigh. Oh, to write like that. So how did I end up writing fantasy? That started with Ursula Le Guin’s A WIZARD OF EARTHSEA, which enthralled me with its exploration of the human psyche right along with magic and mystery. If there is any direct influence from these authors, I think it comes out in my sheer love of entertaining story telling, with multiple plot strands and complicated characters undergoing life-changing experiences. The Prince’s Man is only a ‘click’ away! Your first fantasy, The Prince’s Man is what I would call a true “Sword and Sorcery” novel. When did you first focus on the storyline, and how long did it take you to write the book? And another quick question: With oodles of 5-star reviews out there, is there anything you would do differently in the book now that it has been out there for a while? It’s a long story, that begins some fifteen years ago. I wrote a work of fantasy for a publisher looking specifically for novellas. As luck would have it, the company folded just after I’d submitted my work. However, I was quite taken with the land and society I’d created, so I adapted an idea I’d had for a spy story in an SF setting, and put it into this fantasy world. I was amazed at how well it worked! It probably took me a couple of years to write The Prince’s Man, and at least another to polish it. I’d entered the first chapter in a UK Arts Board competition and it won! The prize was a residential writing course, and the tutors were very encouraging, so I submitted it to an agent in the US and she took it on. It went to all the big publishers, but all I got were encouraging negatives. While this was ongoing, I was building my writing credits, becoming a regular contributor to UK and US equestrian magazines, and when Prince’s Man failed to sell, I decided to have a go at non-fiction instead. This was more successful, and (as you’ll see further down) I have 2 non-fiction hardbacks in print. At this point I still wanted a traditional deal with a fiction publishing house, so I tried again, this time writing my urban fantasy, Desprite Measures. This one was ready to query in 18 months, but by this time I’d started to become aware of the whole indie publishing scene, and after a couple of failed attempts to sell DM, I decided to go it alone. I spent a year researching and platform building before launching The Prince’s Man, including another spruce up because the manuscript was by now ten years old and my writing skills had moved on. The Prince’s Man launched successfully to great reviews and an Amazon Top 100 ranking for more than 6 months – a huge thrill and the start of a new career. Yes. I wouldn’t use names starting with the same letters! My two main characters are Rustam and Risada. The gods are Chel and Charin, and Rustam’s surname is Chalice, while two of the kingdoms are Tyloc and Tyr-en. Too late to change now, but I won’t make that mistake again. I’m a night owl. It’s a hang over from Uni days – I write late at night when I’ve done everything else and the world is dark and quiet, so no interruptions. I do settle to my keyboard pretty much every night, though there’s so much other stuff, like blogging, answering emails, etc. (not to mention running my daytime business), so I can’t always guarantee to work on the current novel; that comes when I have a burning need to commit words to screen. I do try to produce a minimum of 2500 words per week, but a sitting may produce 300 words or 2000+, I really don’t go in for daily word count goals. I’d love to be more disciplined, but I’ve tried that and my creativity dries up, so it’s a no go. Desprite Measures is only a ‘click’ away! Speaking of Desprite Measures, I love the setting of the story! Are the areas you describe places you have visited before? What do you like the most about the locations that you fold into your stories? Pretty much all the places in Desprite Measures are real, and all locations I love and visit as often as I can – I have a page on my website devoted to photographs of these beautiful spots, all of them less than twenty miles from Inverness (Knock Knock – Leiah interrupting! Click on Inverness to go to Deborah’s Photo Page! We now return you to your regularly scheduled interview!). It’s such an awesome environment around there, wild and deserted and magical, yet so easy to get to. I’m can’t get enough of mountains and waterfalls, and the Scottish Highlands have them in abundance. I have always heard the “old saw” that “Writers should write what they know.” What is your opinion? Should a writer only write about places they have seen themselves, or occupations they are familiar with? Of course, with books like The Prince’s Man that doesn’t really apply, but did you base the location upon locations you were familiar with? Absolutely not. If we only wrote about what we know, we’d suffer a drought of great books! Research is one way – for Desprite Measures I researched Cassie’s occupation as a personal trainer by sitting in on some private gym sessions and asking a whole heap of questions. Places are easy to research too, although it’s probably easier to write colourfully about locations you’ve actually visited. In The Prince’s Man, you’ll find lots of little facts about horses and horse care; something I’m well able to supply with authority, as a way of weaving in personal knowledge to enhance the tale. Of course the setting is entirely fictional, so I mix up places I know with totally imaginary places designed to fit the story – there are enough real details for authenticity, but in fantasy, imagination can be all you need. I read that you have a degree in animal sciences and have studied coaching psychology. Do you use that training when you are developing your characters? Let’s talk about Debby for a moment. Many of your readers may not know this, but in our iteration of the space-time continuum, you are known as Debby Lush. Debby is a professional rider, trainer, judge and author of two books: The Building Blocks of Training and The Successful Dressage Competitor, published by J A Allen. How do Deborah and Debby work out their schedules? We micro-manage time! Without a closely planned schedule, neither Debby nor Deborah would be able to fulfill the requirements of both jobs. I’ve become very adept at prioritizing, planning and scheduling; it’s the only way I can fit it all in. Just as well I only have animals to care for, not children! On the other hand, I realized recently that I was in serious danger of not having any life outside of the two careers, so I’ve eased back on the self-imposed pressure, and allowed myself a little free time when I don’t feel guilty about not working! Indie authors are real people with real jobs. Does your ‘real life’ interfere with Deborah’s life, and how do you work around it? Do you have encouragement for other authors who are also working people? It does and it doesn’t. I’m fortunate in that both aspects of my work are self-employed so I set my own schedules, although earning enough money to live on right now sometimes cuts into my writing, as that’s future income, not immediate. Being an author is a compulsion – if it’s something you just have to do, you will find a way to fit it into your life. My advice on that is to find what works for you – we are all so different, leading such different lives, trying to copy someone else’s routine is unlikely to work. Be an individual – you will find a way. Finally, the Summer Olympics in 2016 are set for Beautiful Brazil! Will you be competing? And if not, who do you expect to attend, and win, the dressage event? A horse loving girl wants to know! I was fortunate enough to be an official at London 2012, so this time I’d like to attend as a spectator again (I went to both Athens and Hong Kong). I’d love to compete but I don’t have a horse of that quality. As to who will win – well, the Brits of course! Please check out Deb’s links here! Leiah here! I think you will agree that Deborah is an extremely interesting and talented person! I want to Thank You, Deborah, for visiting with us today! Let’s all give Deborah a ‘virtual round of applause’ and I, for one, will be watching closely for her next book! Goodreads is an author’s paradise. You can search for readers who have similar tastes to the theme of your book. You can join author groups to learn about marketing, networking, finding beta readers, editors and reviewers, and improving your overall writing. Check out the groups (“Groups” under the main heading). Join those that sound interesting to you. Put up your favorite books under “My Books”. Join discussion groups about books in your genre and become a part of the discussion, while also telling the group members about your books. Don’t be shy about asking for reviews, however, remember that most of us are crazy busy and it may be a while before the really good reviewers can get to your book (I have a waiting list that is edging into two months long). Since your book was published already, it will probably be a while before the good reviewers can get to you if you start asking now. So start READING REVIEWS by different reviewers. You will find that there is a great deal of difference between reviewers. READ reviews before you ask someone to review, and make sure that you are getting the right “fit”. There are people out there that don’t know what they are doing – and those that are just plain useless. And, yes, those who are purposely vicious. Must be something going on in their lives that makes them that way, I don’t know, but they are there. Use caution and choose only those who you believe will “get you”. When you find reviewers you believe will be a good fit, write a nice e-mail, and offer to send them a copy for free. The good reviewers don’t pay for their books, their word is worth more than gold. But don’t just send a copy – ask – politely. And don’t be offended if you get a no – like I said, we are busy and many really good, thorough reviewers simply are too backed up. Look for reviews that aren’t all just 5-star nauseating gushes. Look for realistic reviews that point out the highlights, but also, in a kind and generous manner, point out where the author could improve. Hope this helps! Write if you want to chat. I do take time when I get up in the mornings to answer mail before I start work. Maybe this will help another new author out there – or maybe I am full of cow hockey! Either way, if you think Joseph’s book might interest you, you might give him a shout. Snow is gone, sun is out, and I am headed for the porch! Have a great day everyone! M.K. Clinton had a good year in 2013 and has a bright future in writing. She’s published two books, The Returns and The Returns 2 ~ Showstoppers. The Returns has already won a spot on the Authorsdb Top 50 and the Indie Book of the Day Award. M.K.’s characters and stories have become overnight favorites for individuals who love a good story, but they are also vastly popular with group readers such as school classrooms, senior citizen groups, and even prison groups. She has created characters which will, upon first reading, become instant favorites. And they aren’t your everyday heroes and heroines: they are, instead, people who have been sent back from Heaven in order to fulfill their purposes on earth. Purposes which were cut off too suddenly – sending them straight to The Returns Department of Heaven. Of course, they are all a bit surprised when, instead of human bodies, they are sent back in the bodies of dogs! The Louisiana-based author writes with a rare mix of wisdom and effortlessness. Her characters are wonderfully funny, thoughtful, and insightful. Read on as she answers your questions about the amazing dogs she has based her characters on, becoming a writer, and some Returns back story. Hi, Melissa! Thanks so much for joining me today. As a huge fan of your Returns series, I am thrilled to have you. Now, let’s get to some questions and answers! I know that the dogs and cats that you write about are your own, either those still with you, like Bentley and Pierre, but also passed over the Rainbow Bridge, like Miss Gitty. What gave you the idea to write The Returns with them as stars? My Basset Hound Bentley has a perfect number seven on his hip. I knew that there must be a reason for him to have it besides him being our seventh dog. I thought about writing a children’s book but the idea of making him an FBI Agent with that badge number just came to me one day. The rest of The Returns just fell into their characters because of their personalities. Writing about them is a joy because it brings the ones I’ve lost back to life. I get to laugh, play, and enjoy them once again. Once you had decided that you were going to write, what particular challenges did you face? I’ve always been a reader but had never thought seriously about writing as a career. My husband urged me to sit down and put my stories into a book. We have always made our pets “talk” and given them human characteristics. The Returns is very easy for me to write because the dogs are very funny naturally. My biggest challenges were diving into the business of self-publishing, self-promotion, and not knowing whom to trust for answers. The publishing industry is a very vast ocean and there are some sharks swimming around looking for innocent victims. Fortunately, there were some great people out there to throw me a lifeline. Could you tell me a bit about your journey as a writer? Were you that weird girl (like me) who was always with a book and constantly making up stories in your head? I’ve always enjoyed making up stories in my head. I used to read to my children and I’d ad-lib the lines in the books to make them laugh. Once I became busy working and being a mom, I had little time to devote to pleasure reading. I wrote newsletters, speeches, and that sort of thing but never attempted a book. Most of my stories were just funny, off the top of my head tales to makes my children or the students I worked with giggle. When the children graduated, I started reading books as though they were water and I’d been lost in the desert for years. I had to catch up on several years of reading! One of my favorite things in your stories is the healthy, generous, respectful group friendship that your characters have. What is your advice to those of us who wish to form supportive friendships like that? Hey, just because they are dogs doesn’t mean the advice wouldn’t work! I think true friends are such a rare gift in life. The Returns are such great friends because they respect each other, they accept one another as they are, support each other in everything, and they love to laugh. If you can have a friend with those qualities, they are definitely worth hanging onto for a lifetime. Of course, dogs are all born with those attributes, which is why they are considered man’s best friend! What is the most encouraging thing anyone has ever told you about your writing? I have had some very encouraging responses from my writing. My husband tells me all of the time that he knew I could do it. I had a woman write to tell me she wanted me to become her personal storyteller and that I helped her through a dark time. Seriously, I have been blessed with some amazing readers who have been incredibly encouraging to me. It is difficult to narrow them down; I have had some reviews that were so touching, that they brought tears to my eyes. When I wrote The Returns, I never expected such an outpouring of kindness. It is very humbling. Many of the funny things that happen to the characters are taken from real life experiences. I could tell you what they are but I might have to go into a witness protection program! Many of the sayings the gang use are common phrases here in the south. I am sure that “Y’all” is one of the first words most southern babies say right after “Daddy” and “Mama.” I have had several people read my books and say that it is just like talking to me. I hope that is meant to be a compliment. I was wondering if you could give some advice for writers who are just starting out. Whenever I see this question on my favorite authors FAQ page they always seem to give the same answer: Read, read, read. I was hoping if you could add more to this answer! Reading is crucial to being able to write a book that you’ll enjoy. I believe the key to writing a book that you’ll be proud of is to write about what you really love. I know that next to my human family members, my dogs are whom I love most in the world. They are my furry family so it’s like writing about my children. I have loved dogs all of my life. They are one topic on which I have a fair amount of knowledge. It is important to know your subject, your characters, and to love the story. If you don’t, it will be very apparent to the reader. What type of atmosphere do you write in? Do you lock yourself in a room alone, write at coffeehouses, or something in between? I like a quiet room with the blinds open and several cups of coffee. The dogs are usually hanging around with me and occasionally bum a scratch but for the most part, I am in “the Zone” when I write. It is not unusual for me to look up from my keyboard realizing that three hours have passed in a nanosecond. I never use an outline to write. I will jot down pertinent facts, my timeline, and descriptions as I go along. There are many times where I have to go back to re-read what I’ve written because I have no idea what I’ve typed. This is how “the Zone” works with me. I am usually as surprised by what The Returns do as my readers. When I go back over a chapter, I can find myself laughing or crying just as if I’d never read it before, much less written it myself. I’ve read that writing is an acceptable form of schizophrenia because my characters definitely talk to me. Once I start a book, they will pop in my head at the most awkward times. I’ll stop on the grocery aisle and start typing on my cellphone so I don’t forget what they say. They also like to chat amongst themselves just as I am almost asleep. I think they do that on purpose! I’m anxious to begin the gang’s new adventure. I don’t want to give away too much for those who have not finished with The Returns 2 ~ Showstoppers but most of the new characters will be back. The New Orleans FBI has been receiving bomb threats and the crew will certainly need to lend a paw to help catch the villain. Faith will still be ruining perfectly good meals and as usual, Miss Gitty will be dishing out her “catty” advice. 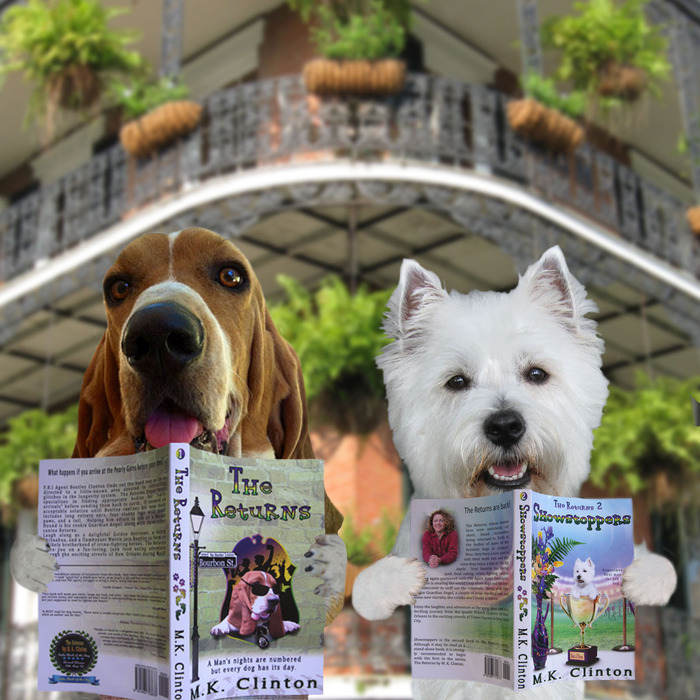 It should be another great time in the Big Easy for dog and cat lovers or anyone who enjoys a fun imaginative book. Finally, is there anything else you would like to talk about? I know that you are a big supporter of animal rescues and animal rights causes. What can we all do to help? I have always had the desire to help the homeless and abused animals. Like most people, I had no idea what I could do that would make a difference. I have joined the ASPCA Advocacy Brigade that gives me an opportunity to voice my support for laws to protect animals. My blog, “Barking from the Bayou” which I hope to establish as an informative and fun site for dog lovers to follow has ideas. There are widgets on my sidebars that will provide a bowl of food for a pet, a petition for pet food safety laws, a pledge to not shop stores that sell dogs, a tab for ways to volunteer, and adoptable dogs. There are so many ways that each of us can make a difference in our own communities. I always thought it was so sad to see those little dogs in the shelter cages. I finally realized it is sadder to see them in those cages when I was not doing anything to help. One person can’t do everything, but every person can do one thing. Thank you SO MUCH! It was, as always, such a pleasure to speak with you, and learn more about you. 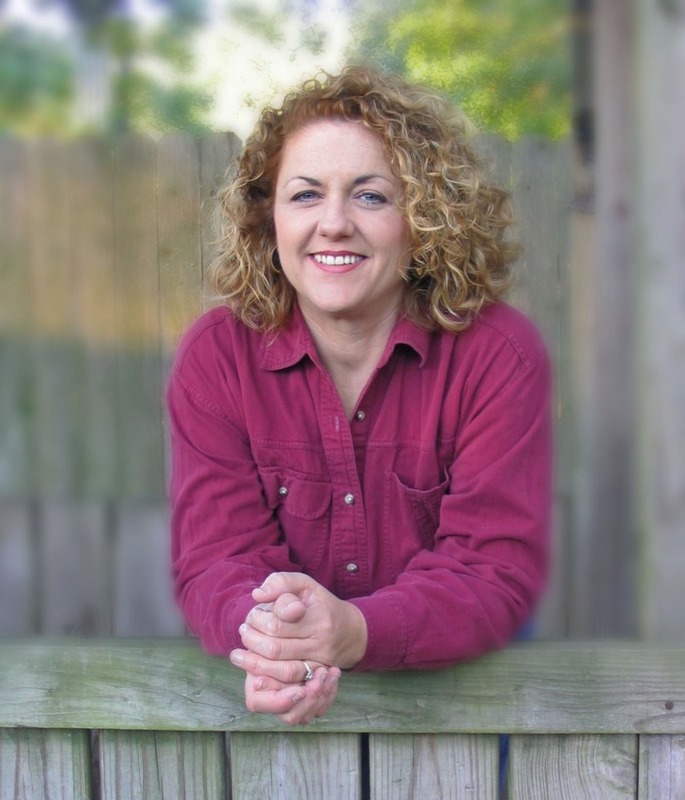 If my readers want to learn more about Melissa and her family of furry friends, check out www.mkclinton.com – it is a wonderful site!